Was this why? Was this the reason he’d told her to be quiet, because this needed to happen? The middle of winter has given the residents of the warehouse plenty of time to mull over their last adventure. The Storyteller has been found, but has left behind only more questions and no real answers. Just when the group exhausts all of their resources, a new organization comes to the surface that could tie up all the loose threads. Unfortunately, the Chapter isn’t what it appears to be, and the Hunters are now left to deal with a new threat that hits a little too close to home. What secrets is the Chapter hiding, and is it worth uncovering the truth? Oh my gosh why did it have to end?! I so enjoyed this book and couldn’t put it down. The overall storyarc hit its stride here. The writing was tighter and the omniscient point of view clearer. I love the voice Ms. Lawrence and Ms. Walsh have together. The way they weave this story and leave hints along the way. It’s wonderful and a joy to experience. I figured out Mr. Suttic and his role pretty quickly but I loved how the reveal of that came about in the story. There’s a line in the book that is such amazing foreshadowing that I was like “AH! SEE! I KNOW THAT’S GOING TO BE IMPORTANT LATER!!! !” complete with yelling outloud. I don’t want to include the line because it would totally be a spoiler later on I think so I don’t want to take that chance. I loved how all of the characters grow in this book. They have their own battles to wage; some internal while others are actual physical confrontations. All of the characters managed to surprise me in some way throughout the story. Fagan was absent through most of the book but he was dealing with things that I think will come up in the next book. Plus he’s that fun character that’s part of the story despite not being on page. The way Ms. Walsh and Ms. Lawrence managed to pull that off was wonderful! I loved the distinction in pronouns with Alix. It was perfect and showed that aspect of his life that started to become a key part of the story. Zach though, Man he has matured so much but still manages to be that same snarky kid you can’t help but fall in love. My heart hurt for Kat but I won’t say anymore because spoilers. I’m beyond fascinated where this series is going to go next. I’ve got some guesses and theories. But I seriously need to know what happens next! Jessica Walsh knows there’s this feeling, when you read a good book, that the world around you melts away to reveal new universes that stretch beyond your imagination. For a good portion of her life, Jessica has chased that feeling by reading books and delving into fantastic worlds that were always so far away. Experiencing those fantasy worlds could only work for so long and soon there was the urge to bring it here, to the real world, so others could feel the magic she felt with each turn of the page. She does this in her writing by bringing a feeling of realism to her stories. By combining monsters, magic, and mythical creatures with the world we all live in, it’s not too hard to consider a bookstore owner with the power to change the words on a page, or a performer who can make flowers grow in his hand. However normal the story may start, there’s always something lurking in the background, ready to hint at something more. Now she’s on a journey to share her creations with everyone. She travels to various conventions and presents her written escapes to the people around her, expressing her creativity with her words, her crafts, and her sewing. She’s combined the favorite aspects of her life to show the wonderful fantasies that exist in our everyday lives. At the age of nine, like most kids, Briana Lawrence had a dream. She wanted to be the best “WRITTER” in the whole wide world. Her fourth grade class laughed and wondered how one hoped to become a “writer” if they couldn’t even spell the word. Back then her stories were created with crayons and construction paper. As she grew older they progressed into notebooks and colored ink pens of pink, blue, and purple. When she lost her older brother, Glenn Berry, in a car accident, she stopped writing. Dreams, however, have a funny way of coming back. Before she realized it she was grabbing her notebook and pens again. She would write stories that ranged from high school romance to her imagination running wild with the likes of Goku, Vegeta, and the other characters of Dragonball Z. This continued throughout college where she would always end up writing about the space exploits of the pilots of Gundam Wing and other works of fan fiction. Soon she realized that she wanted to do more than that. Her head was full of ideas, full of original characters and worlds that she wanted to share with others. Thus, she stepped into an English Major with some Women’s Studies on the side. She graduated Iowa State University in 2006 and moved to Minneapolis with her partner. Here, she tried to get into graduate school, but things didn’t pan out the way she wanted. She ended up working retail, her dream becoming buried by Black Fridays and other busy times of year. Once again, however, that dream returned. She went from immersing herself in geeky fan fiction to actually writing about the geeky things she loved for several anime and video game review sites. However, it was her discovery of National Novel Writing Month that made her go back to creating her own characters and plots. Now, here she is, an author in the writing world. 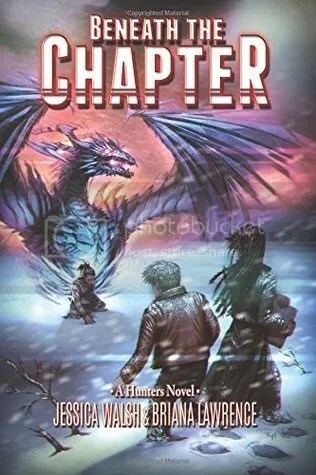 This entry was posted in Reviews and tagged Author: Briana Lawrence, Author: Jessica Walsh, Dragons, HFN, Location: Minneapolis, Location: Minnesota, Molly Reviews, Rating: 4.5 stars, Series, Urban Fantasy. Bookmark the permalink.